For a while, I thought we were never going to reach this milestone. It seemed like the list of small jobs that had to be done just kept going on. Finish one thing, and then I’d find another. But with grudging perseverance, we did it. All the steel work that had to be done, was done. On September 4th, Yamoya left her home to go and be cleaned and painted. This turned out to be easier than expected in some respects, and harder than I wanted in others. 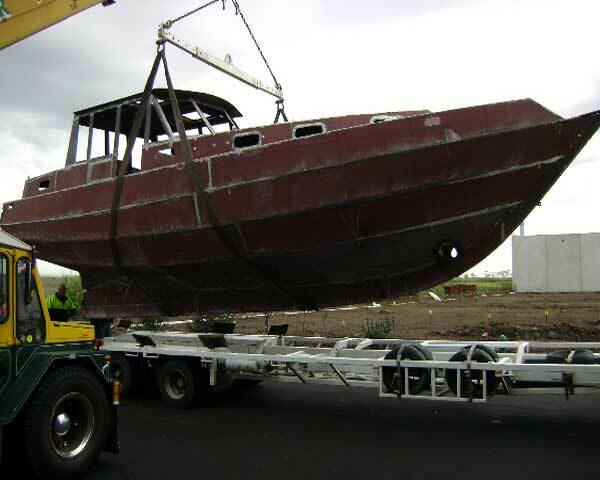 We decided to completely contract out the logistics of removing the boat from the factory and transporting it to the abrasive blasting yard. The company we decided on, L.Arthur Transport Services, surpassed our expectations. Completely! When Bill came to inspect the job for the first time his reaction was, “You’re f…ing kidding me! Are you telling me that you’re giving me 5mm each side to get that boat through this door?” An over-reaction. 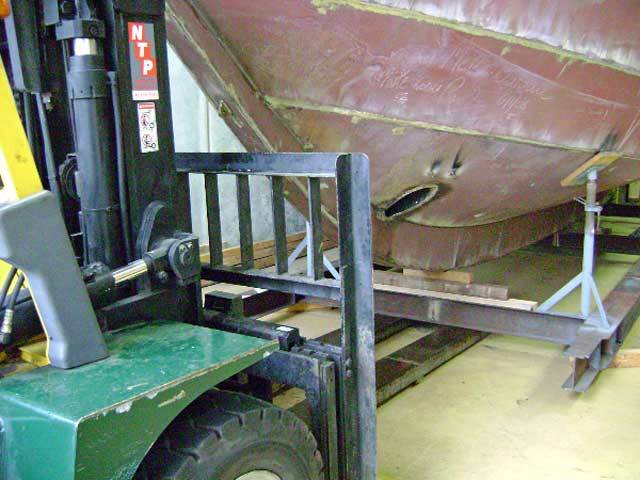 The boat had an easy 10mm either side to fit out the roller door. When the team arrived to do it, they called themselves the A-Team. They certainly were and they just made it look so easy. After all the concern about getting Yamoya out of the factory and onto the truck, she just rolled out, with the help of a forklift lifting one end and pulling, and some machinery skates at the other end. It fitted through the roller door without once touching the doorway. Just hope they can put it back in the same way – I don’t want any scratches on the new paint. Everything else just flowed. They were able able to do the lift in one go – no re-adjustments of the slings necessary. First lift, perfectly balanced. On to the truck, tied down, and off to be cleaned and painted. 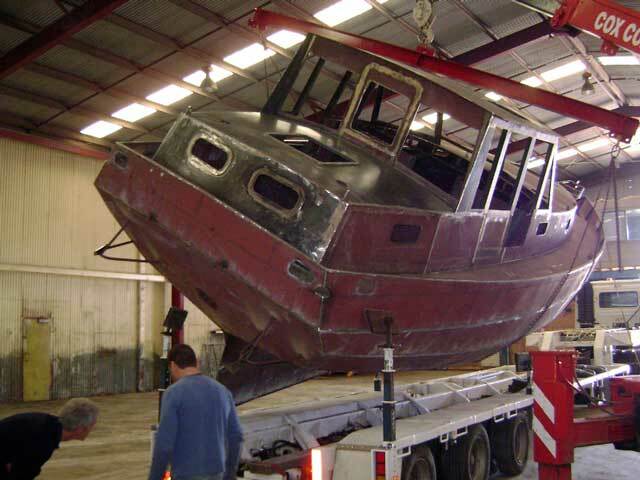 The transport services company decided that they didn’t have the correct type of truck, and so they sub-contracted the actual trucking to a specialised boat carrier, Boatrans. The truck driver did a fantastic job. This is the first time I’ve seen a really good use of technology in a long time. During the tie down, the truck driver would get a second opinion, as part of his quality control, by using his mobile to do a video call back to head office. Well that was the part that I thought would be difficult, and it turned out to be easy. Though, these things take longer than what you’d expect. About 3 hours from start to the truck pulling away. The transport company was only responsible for getting Yamoya out of the factory, onto the truck, and delivered to the abrasive blasting yard. The yard was then responsible for lifting Yamoya of the truck and into their shed. Apparently they had the equipment and skills to do this. What do you think? At this point I was sure that I was going to witness Yamoya crashing to the ground. But some level-headed thinking and experience from the truck driver saved the day. He acted far beyond what he needed to, and was able to save the boat and save his truck from any damage. I can’t say enough how impressed I was with L.Arthur and Boatrans. Excellent job. The boat went to the abrasive blasting and coatings company on September 4th. As of September 30th, they still hadn’t started. It’s about a 5 day job, and I was expecting that Yamoya would be back in our factory by now.